Pingdom is an easy-to-use monitoring service that helps companies ensure that their online services are available, and highly performant. Since 2007, Pingdom has made a name for itself as one of the industry leaders in web performance monitoring software. Today, more than 700,000 customers (including Twitter, Spotify, and Facebook) use Pingdom to test the availability and performance of their websites and services. Although Pingdom is likely overkill for those just looking for a basic uptime monitor, the product delivers high-quality, customizable synthetic monitoring and real user monitoring capabilities that can be a worthwhile investment for companies that need to ensure the ongoing availability and performance of their websites. Powerful uptime monitoring, RUM, and synthetic monitoring capabilities help identify any issues that your website may be facing. Alerts are highly customizable and can be sent through email/SMS, and through other systems like PagerDuty and Slack. Mobile apps enable users to check the status of Pingdom tests on the go. System is designed to be easy to use, and doesn't require much technical background to set up. Can get pricey if you have a lot of websites or high volume features that need to be monitored on a regular basis. Unnecessary if simply looking for a few uptime checks, i.e for a personal blog. To fully reap the benefits of the transaction monitoring features, users must have a basic knowledge of programming. $14.95/month to $249/month, depending on your volume and needs. Enterprise pricing starts at $495/month. $9/month per server, for server monitoring (new as of May 2017). Is Pingdom the right software for you? Based in Sweden, Pingdom has a decade's worth of experience with web performance monitoring. Today, it has acquired more than 700,000 customers, including highly trafficked sites like Facebook and Twitter. In June 2014, the company was acquired by SolarWinds, a company that focuses on enterprise infrastructure management software. Solarwinds continues to sell Pingdom, and the team continues to add new features and capabilities to the product, even after the acquisition. Pingdom is widely used by companies that want to monitor the availability and performance of their services on a frequent basis. Because you want your site to be available 24 hours a day, 7 days a week, Pingdom has also developed mobile apps to help you check on the status of tests, even when you are away from the office. The company used to offer a basic monitoring service for free, which is one of the reasons why it was so widely adopted. However, as of early 2016, the company stopped supporting these basic free accounts, and now the basic monitoring packages start at $14.95/month. You can still have 1 check for free with Pingdom, but if you're simply looking for an uptime check for your website, then there are some popular alternatives that continue to offer this service for free, such as Uptime Robot. The core functionality of the service are very user-friendly and easy to get started with, though more advanced features like transaction monitoring require some basic programming background, and knowledge of HTML. Pingdom also provides dashboards and reports to help users determine if performance is on a downward trend or improving over time. Overall, Pingdom has earned its place as a major player in the website performance monitoring space, thanks to its ease of use and sophisticated monitoring capabilities. Below, we'll discuss the key features of Pingdom, and how they can benefit your business. Ensuring that your website and online services are running smoothly is particularly important if your business makes its profits entirely online. A service like Pingdom can help ensure that you are proactive and able to detect issues before they negatively impact your users. 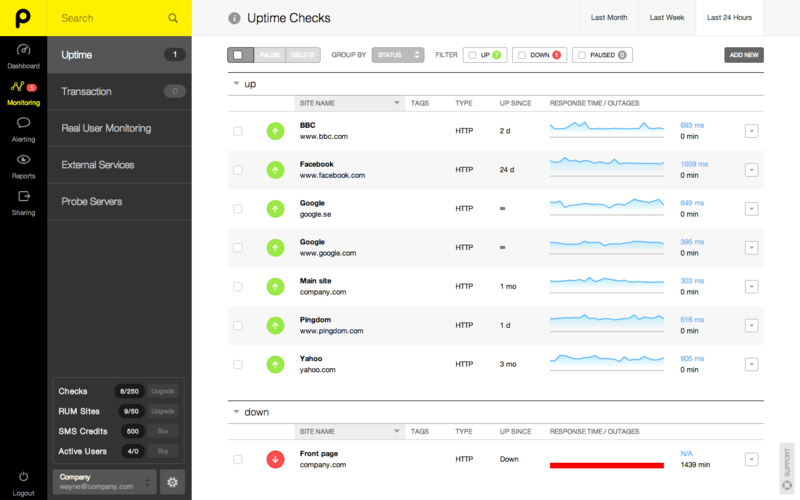 Pingdom tests the availablility of your website every minute, and alerts you if it detects a problem. By testing your website from more than 60 global locations, using multiple types of web browsers, Pingdom helps you feel confident that your services are available to users all around the world. If your business has global reach or is expanding overseas, it can be very helpful to validate that your availability extends outside of the country where you are headquartered. If Pingdom fails to receive a response from your website, it will try pinging your site again from another location, before notifying you of the situation. This can help avoid needlessly alerting you if the failure was a temporary glitch. Pingdom also generates reports that include graphs to help you visualize your website's availability and performance. With easy access to all of Pingdom's rich data in an easily digestible, visual format, you can nail down a strategy for improving your website(s). There's a reason that synthetic monitoring is also called proactive monitoring -- since it simulates users' actions rather than monitoring real users' actions, you can potentially detect and resolve issues before they ever land in front of your users. This enables you to proactively improve your website, test newly released features and recent changes, or find out if anything is too slow or inaccessible. You can use it to test out a new page or functionality (e.g. you just added support for customers to pay by PayPal) before it's released to the public. Users rarely stay on the first page they visit on your website. They may interact with any number of elements on your site, and you'll want to make sure that all of them are working as expected. To test that multiple components of your site are working in a way that your actual users might expect, you can set up Pingdom to monitor multi-step transactions from start to finish. To leverage Pingdom's transaction monitoring capabilities, you'll need to have some programming background and knowledge of HTML. Using the provided editor, you can specify a sequence of events, and conduct custom tests of a typical user's journey across different parts of your website. For example, you can test the steps a user might follow as he/she visits the homepage, logs in, navigates to the jewelry section, clicks to view the item, adds the item to their shopping cart, and checks out using a credit card. If any step in this typical sequence fails, it could negatively impact your business. Pingdom compiles all of the data from the tests into a report so you can assess your current level of performance, and improve upon it. Performance metrics can be broken down by user location, so you can determine if your page is loading more slowly in some countries than others. You can also set performance goals and get alerted if Pingdom detects that your real users aren't receiving those levels of service. Though Pingdom has excellent tools in place to help monitor the health and performance of your website, historically, it hasn't been useful in monitoring the health of your servers. Server monitoring helps identify any issues before they impact your customers, and can let you know if any of your servers are down, or if your website has experienced so much growth that you'll need to add additional servers. In May 2017, SolarWinds acquired Scout's server monitoring technology, and began offering it as a product called SolarWinds Pingdom Server Monitor. 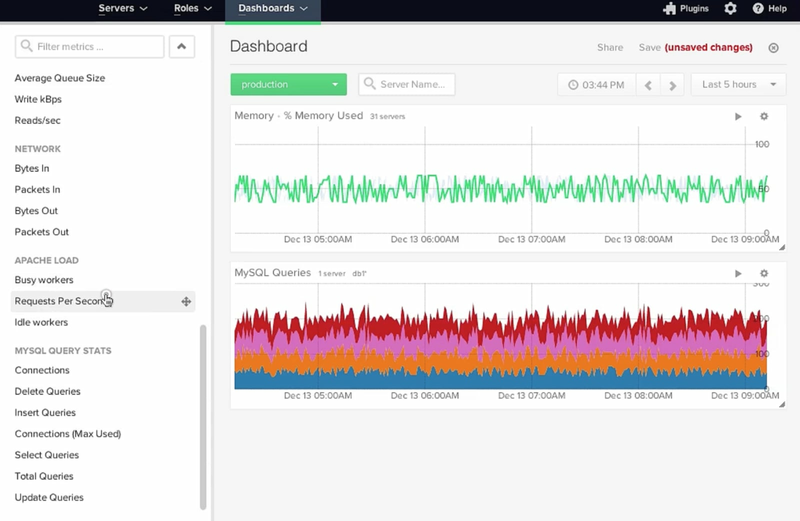 With this tool, you'll be able to monitor your servers' key performance metrics, including CPU usage, memory, and disk space. This functionality is sold separately from Pingdom's core monitoring product, for $15/month per server (but there is currently a discount available for new customers at $9/month per server). Using Pingdom Server Monitor, you can create dashboards quickly, which can give you a comprehensive view of your servers' performance. Alerting is a key part of monitoring website performance and uptime. When a business-critical page is unavailable or loading very slowly, you need to find out right away. Pingdom is able to alert you via your preferred communication method(s) so you can be ready to take action if something goes awry. Pingdom can contact users via their preferred communication method, whether that's a phone call, email, text, or through chatting applications like Slack and HipChat, and notification systems like PagerDuty. Alerts can be assigned to the appropriate team members, so you can make sure that alerts go to the people who know how to take action in each specific situation. Alert conditions are also customizable to your needs; for example, you can specify that you want to get paged by phone after a business-critical page has failed to load in the past 2 minutes, but you may only want to get emailed if a CSS style element fails to load on a less critical page. This customization can help control your false positive alert rate. Is Pingdom the right monitoring system for you? Pingdom is a popular monitoring solution that ensures the availability and performance of business-critical websites. Used by reputable tech companies like Facebook, Pingdom supports both synthetic and real user monitoring, to provide users with a comprehensive overview of their website's performance. If you simply want an uptime monitoring system for a few sites, then Pingdom may be overkill, and you may be able to get the functionality you need from a free system like Uptime Robot, or Uptime Doctor. However, the free plans for those systems are limited in the number of checks, and don't offer the robust RUM and synthetic monitoring capabilities that Pingdom offers. If your website has a substantial amount of traffic and any downtime it experiences will result in lost revenue, then it's worth paying for a more robust system like Pingdom. If you are constantly implementing new features on your website, and don't have the time or staff to write your own tests from scratch (or just want a service to supplement your existing tests), Pingdom can be an excellent option for you. Pingdom helps save you time by automatically testing new and existing features, while accounting for various geographical locations, web browsers, and user transactions. However, to fully take advantage of the full power of Pingdom, like accessing the API and setting up tests for more complex transactions, users will need to have some experience with coding. Whether you know how to code or not, you can use Pingdom to help detect and get alerted to issues before they impede user experience and negatively impact your bottom line.